I’ve yet to meet a person who could say no to a cinnamon roll fresh out of the oven. Add some gooey caramel to that mix and it’s downright irresistible. 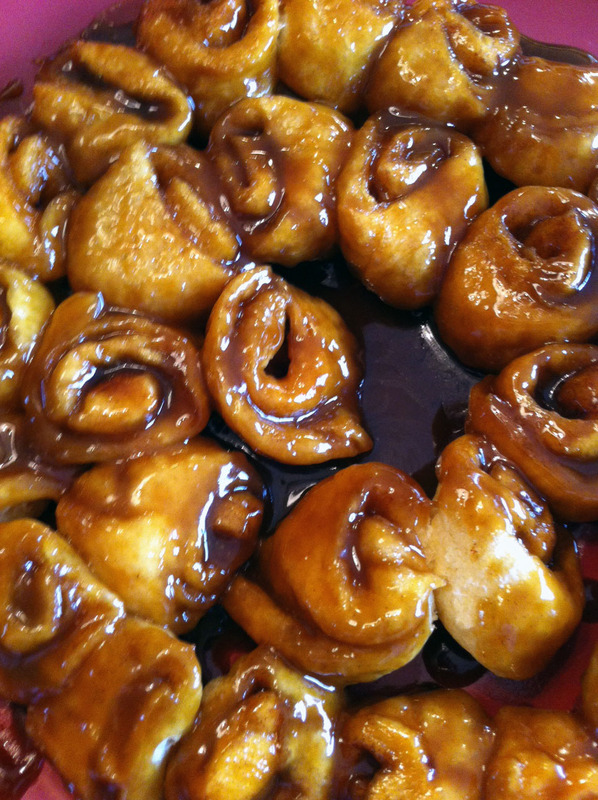 Unfortunately fresh homemade caramel rolls aren’t exactly easy or quick to make. The method my mom used when I was growing up would severely cut into my precious weekend sleep in time so instead I made this shortcut version and I wasn’t disappointed. So buttery and gooey, these are a surefire winner, so much so I’m slating them for Christmas morning breakfast. An extra benefit, they’re tiny so you don’t have to feel bad about eating more than one! In a small microwavable bowl, add the 1/3 of a cup of brown sugar, butter, corn syrup and milk. Microwave on high, stirring once every minute until the mixture gets smooth and bubbly. Pour into a well greased 9″ pie pan (sprinkle the pecans on top if you’re using them) and set aside. Open the crescent rolls, unroll the dough and separate it into four squares along the perforated lines. Pinch the dough along the diagonal perforations to seal. Sprinkle 1 tablespoon of brown sugar on each slice along with some cinnamon and roll up jelly roll style starting from the long side. Pinch the seams to seal. Cut each log into 8 or 9 pieces and place, cut side down on top of the caramel in the pie plate. Bake at 375 for about 16 minutes or until golden brown. Let cool for about a minute before inverting on to a serving plate. I defy you to eat just one. For those of you following along, you know that I like to head to New York state to pick up grocery products that aren’t necessarily available in Canada. One of the products that has consistently made the list the last few trips has been V&V Supremo brand chorizo sausage. In fact, last trip I may or may not have purchased $50 worth of it (enough to last the winter) at Price Chopper. This is a Mexican style chorizo: fresh, not dried like the Spanish style, and with an awesome spicy kick. I’ve tried both their beef and pork versions and while both are awesome, I’d give the edge to the beef. While the pork has a richness, the beef has an extra depth of flavour that the pork is lacking. The chorizo comes in packs of two half pound portions for around $6. I find one is enough for a meal for me and Mr. Bacon and it defrosts very quickly so it’s a great last-minute dinner. So what do I make with it? So far we’ve used it as a great ready-made filling for tacos and for a Mexican spin on this fritatta recipe. In this one, I nuke the potatoes until soft, peel the skins off and dice them. While the potatoes are nuking I cook the chorizo in a frying pan, squeezing out the flavourful fat with a spatula and reserving the meat on a plate when it’s done. Then I fry the potatoes in the chorizo oil and add 6 eggs beaten with a splash of milk. The chorizo gets sprinkled on top when the eggs are mostly cooked through along with a handful of crumbled feta cheese (or queso fresco if you can find it). Then I throw a lid on top and let the eggs finish cooking through. It’s a crazy good dinner or a great brunch. I’m dying to try more ways to use it like queso fundido, nachos and as a stuffing in tamales. Next time you’re in the US, pick some up – you won’t be disappointed!